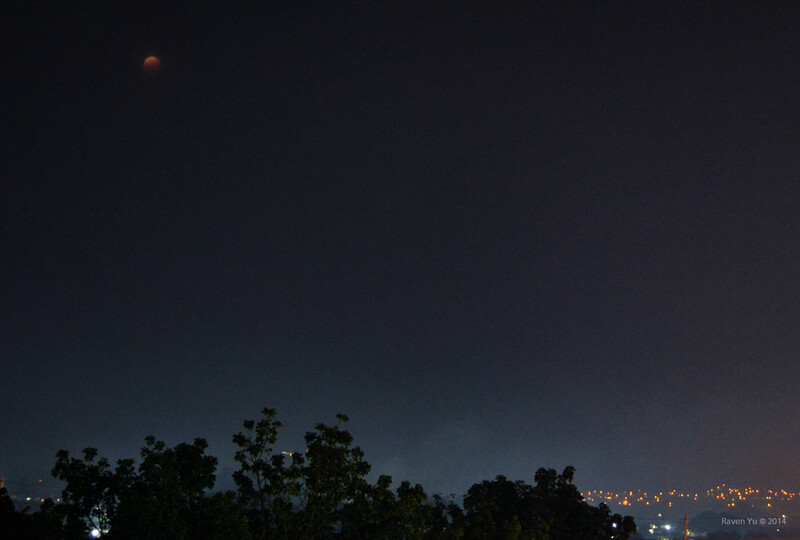 A glimpse of tonight’s ‘Blood Moon’ amid cloudy skies as seen from Montalban, Rizal. Image was taken a few minutes after totality. Yesterday (Oct. 8, 2014), skywatchers across much of the world, had the chance to see another ‘blood red moon’ as the moon passes behind the Earth and into our shadow. This alignment usually occurs only once every couple of years. 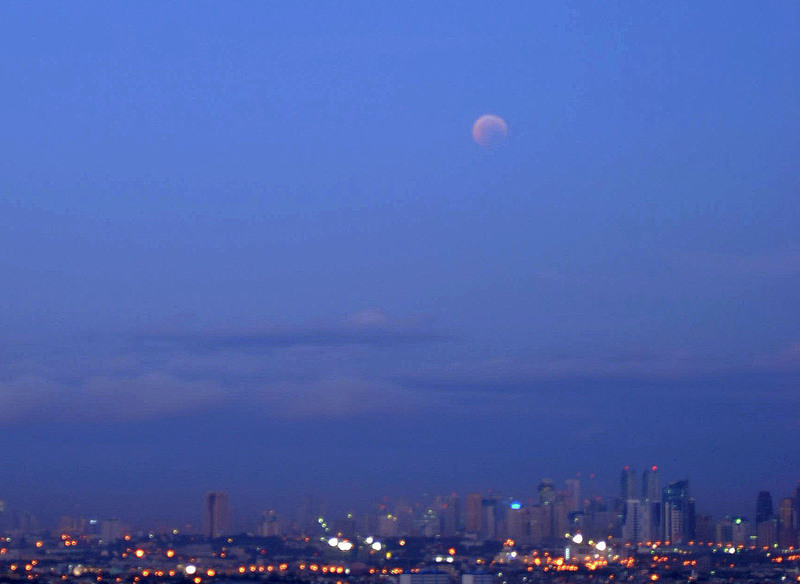 In the Philippines, maximum eclipse occured at 18:55 PST (06:55 P.M.) in the eastern sky. Cloudy skies and rain due to the presence of Super Typhoon Ompong (Vongfong) within PAR threatened to spoil this spectacular event. The weather outlook for the day doesn’t make it conducive for an unobstructed viewing. 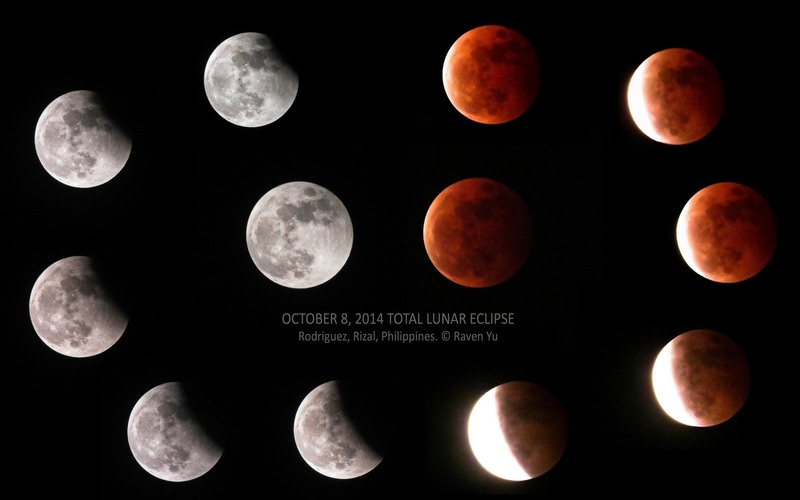 We watched from 5:30 pm to 9:10 pm in mostly cloudy skies. But luckily, we did get good breaks and saw the totality and egress when the cloud thinned at times and the rain held off. Following are some of the images I took using my Canon Powershot SX40 HS and Nikon D3200 dslr. I will post more photos soon. 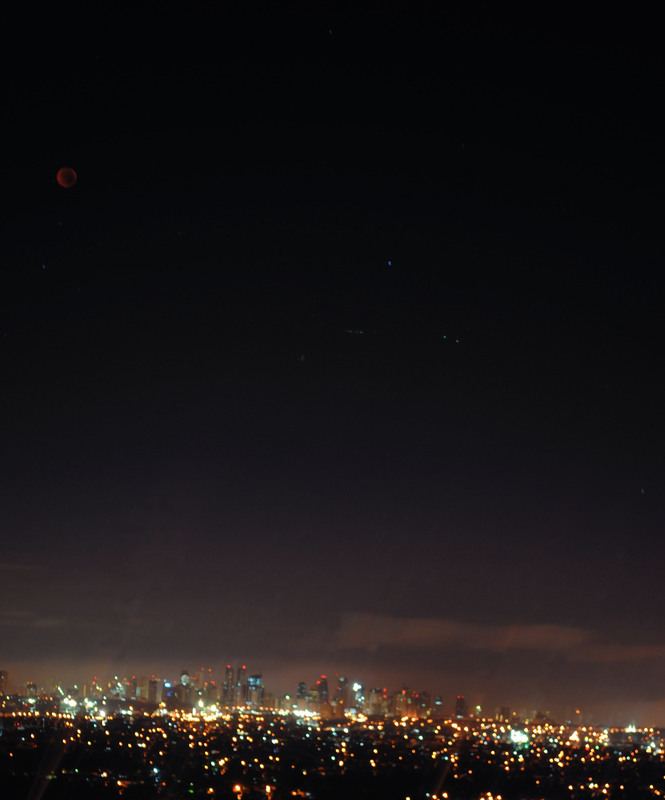 Despite the rain and an overcast sky, we were thankful that for a brief period of time God permitted us to have a glimpse of the Red Moon during the total eclipse of the moon last December 10, 2011. 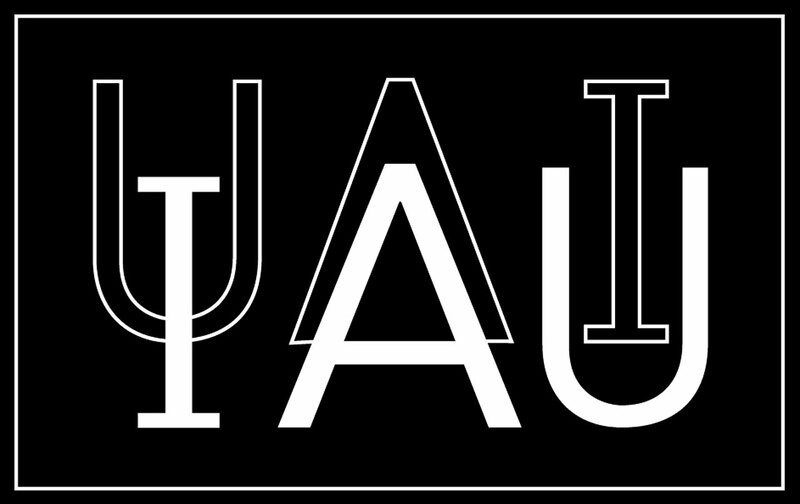 The moon was nearly high overhead during the totality phase of the eclipse and was located in the constellation Taurus. Totality lasted for about 51 mins. After a short while, the clouds began to move away and we had a clear view. 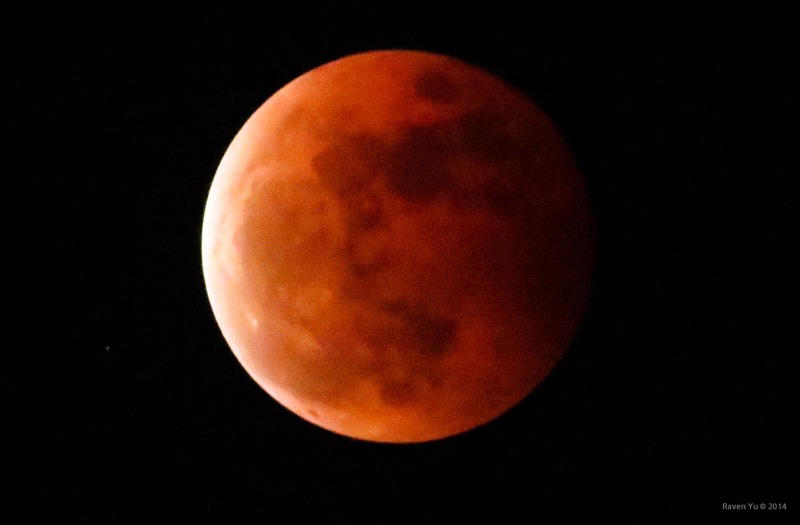 The red tint of the eclipsed Moon is created by sunlight first passing through the Earth’s atmosphere, which preferentially scatters blue light (making the sky blue) but passes and refracts red light, before reflecting back off the Moon. Differing amounts of clouds and volcanic dust in the Earth’s atmosphere make each lunar eclipse appear differently. Moon at 11:27 pm. Only half of the moon’s disk lies within the umbra. Moon at 11:51 pm. A 22 degree lunar halo formed around the moon just before it exited the umbral eclipse phase. By the way, I observed this event together with my friend and UP AstroSoc orgmate, Bea Banzuela. We were eating a cold dinner (literally!) from the rooftop of their house in Marikina City while checking the sky and taking photos of the moon. The lunar features in this image are more recognizable. 🙂 I love that camera! Haha! Thanks Bea, for allowing me to repost this. 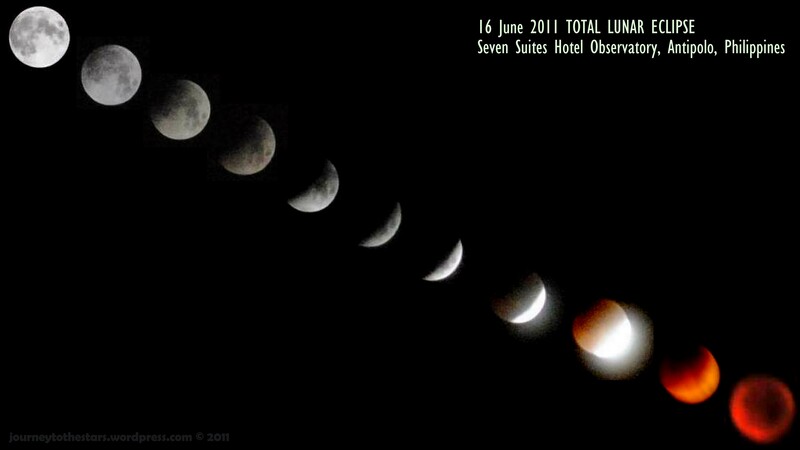 I began my preparation to observe the June 16, 2011 Total Lunar Eclipse as soon as I’ve learned about it several months ago. It was a relatively rare opportunity to observe a Total Eclipse of the Moon — not to mention that the duration of totality of this eclipse will be one of the longest in 100 years (totality lasted for 100 minutes, from 3:22 am until around 5:02 am PHT). I immediately checked the eclipse circumstances available in the NASA eclipse website and estimated the location of the Moon for each phase using Stellarium, so as to choose the best place to observe the event. I also reviewed the previous photos I’ve taken to see which places have a clear view of the southwest sky — the region where the Moon was mostly located during the course of the whole eclipse event. 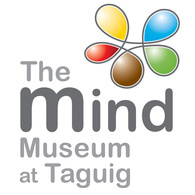 After considering a few sites, I came down to only three choices — the PAGASA Observatory in UP Diliman, a place along San Miguel by the Bay and at the Seven Suites Hotel Observatory in Antipolo. Dropping the other two choices, I observed at the Seven Suites. Since I still have a class to attend the following morning, observing at San Miguel by the Bay was the least good option. It surely was a nice place to observe as it has a very clear western horizon (which will enable me to catch a glimpse of the eclipsed moon setting at the bayside), but traveling would be a bit of a hassle for me because it was too far. The most convenient choice was actually to observe at the PAGASA Observatory. It’s just a walking distance away from my college and most of my orgmates in UP AstroSoc were there, too. However, I was worried that the buildings surrounding the observatory might block the view of the Moon when it gets too low during the last phases. Through Mr. Ramon Acevedo or Kuya Ramon — an alumnus of my astronomy org UP AstroSoc — the manager of Seven Suites allowed me and a few more orgmates to observe from Seven Suites for free 🙂 Thanks, Kuya Ramon! 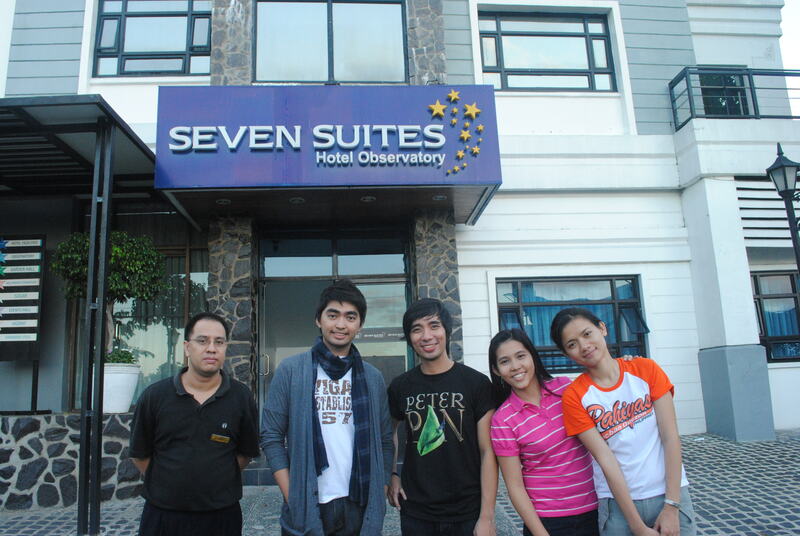 Seven Suites is the first and only hotel observatory in the Philippines. 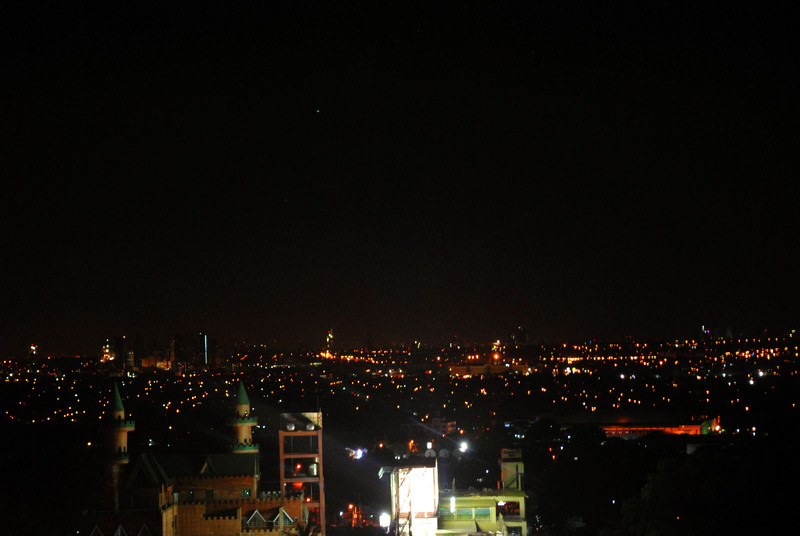 As it is situated along the hillside route of Sumulong Highway in Antipolo City (not too far away from UP Diliman), it offers a breathtaking view of Manila by night — a stunning view of the metropolis, its city lights and the dazzling night sky. It also houses a 12”diameter Dobsonian which is the fourth largest telescope in the country. 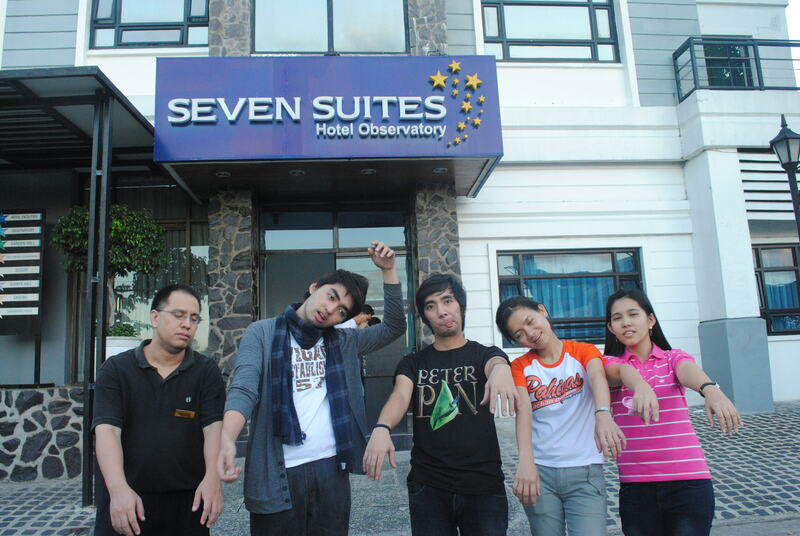 We arrived at Seven Suites at about two hours before the start of the penumbral eclipse. Upon reaching the roof deck, we marveled at the awesome cityscape just below us. The star Arcturus above the cityscape. Despite the rainy weather forecast, thank God it didn’t rain a bit the whole night. 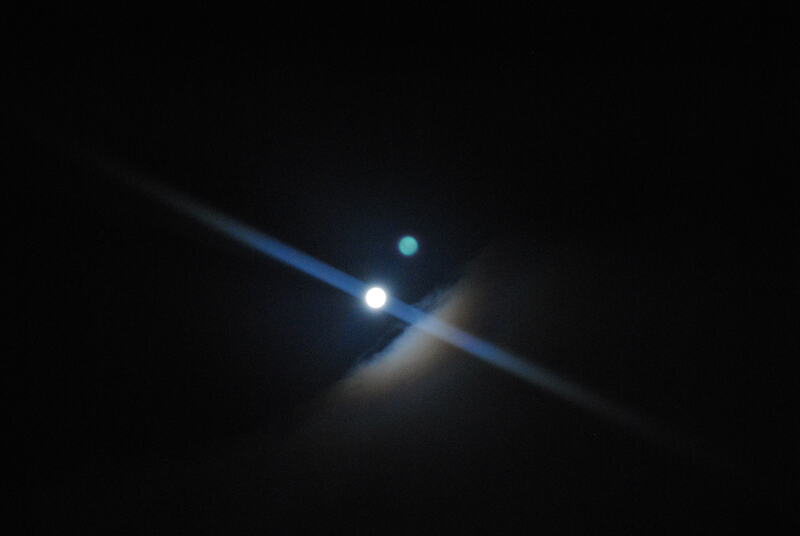 Only a few patches of clouds could be seen floating amid the moonlit sky. A colorful lunar corona surrounded the Moon before the eclipse. 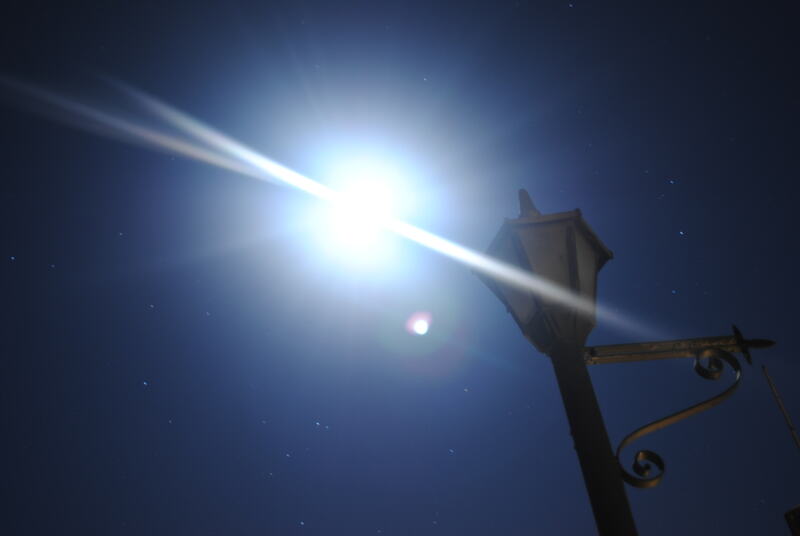 The blue spot appeared because of the lens flare. A few minutes past midnight, a group of mediamen from a local TV Network came to join us to cover the event. Someone from GMA contacted me earlier that day via Twitter for an interview regarding the eclipse. He told me that he learned about me after seeing a post which linked my astro blog. He further asked me where I will be observing the event and I told him of my plan and the time of the eclipse . I also added that another group of my orgmates in UP AstroSoc will also be observing the event from the PAGASA Observatory. After our conversation, he said that they will send a group there. And they did. Kuya Ramon was also notified of their coming. All of us were excited to witness the eclipse. But before it started, a bright fireball zoomed in to our view. It came from the northeast direction, near the Summer Triangle so we guessed that it could be a June Lyrid. 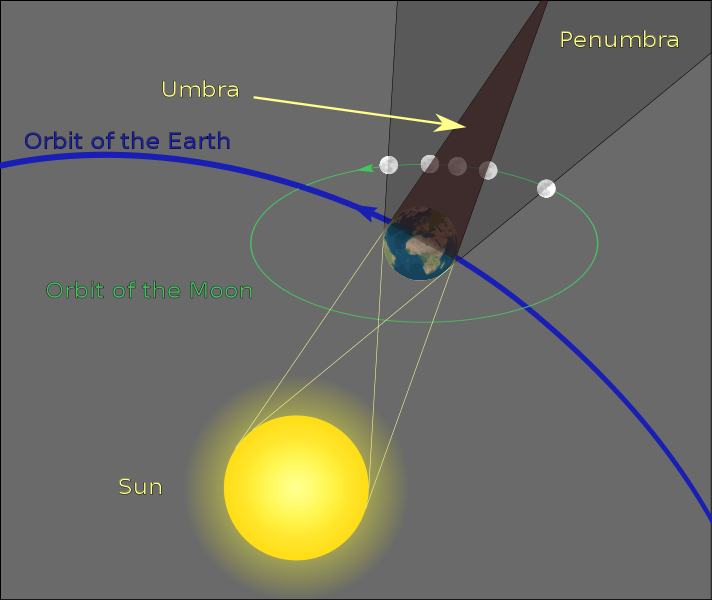 At the time of the penumbral eclipse, no visible changes in the moon’s brightness can be easily recognized until it slowly become dimmer a few minutes before the umbral phase. 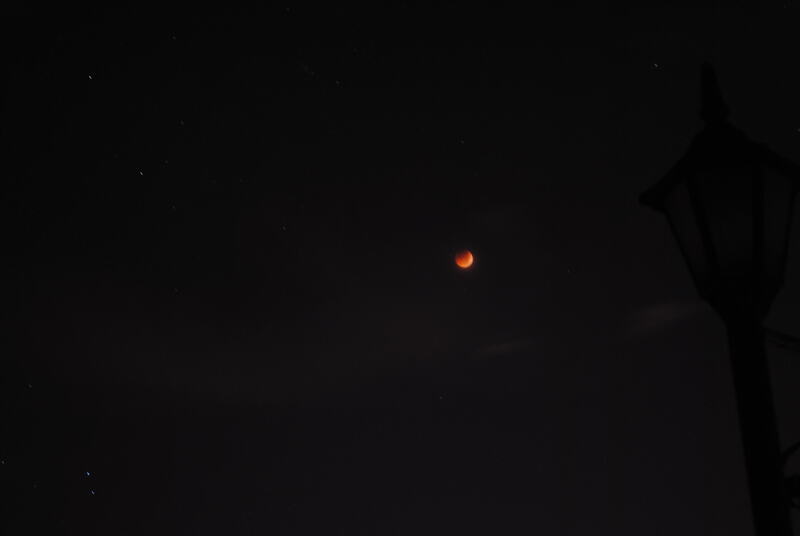 By about 2:30 AM, a small part of the Moon on its upper left limb was already being covered by the Earth’s shadow. This chunk grew larger and larger after several minutes until finally only a small sliver of the Moon remained visible. The Moon entered totality at 3:22 AM. Just before the light on the Moon totally disappeared, an apparent reddening of the lunar disk took place. It became more and more obvious to the eye until the whole lunar disk was transformed to a blood-red orb hanging above among the stars. It was a breath-taking view. 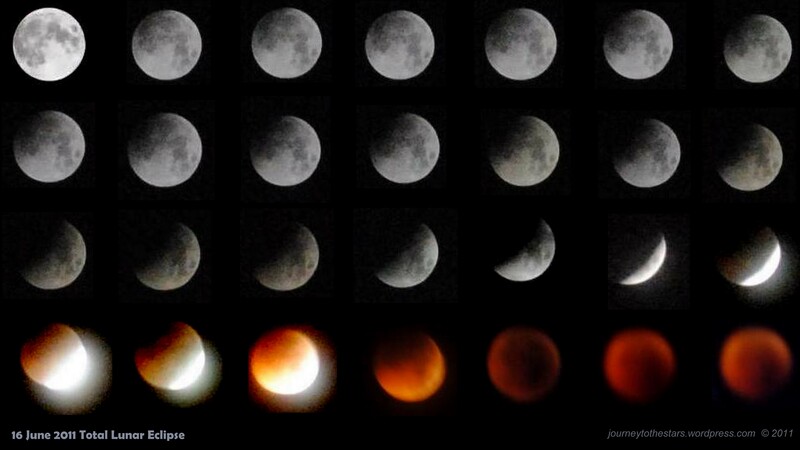 I also created two montage composed of the images of the Moon during different stages of the eclipse. In the second photo, the images were taken by about 5-10 minutes apart. Totality ended at 5:02 AM. Unfortunately, the fifth contact (end of the partial eclipse) and sixth contact (end of the penumbral eclipse) could not be observed from the Philippines since the moonset was at 5:30 AM. 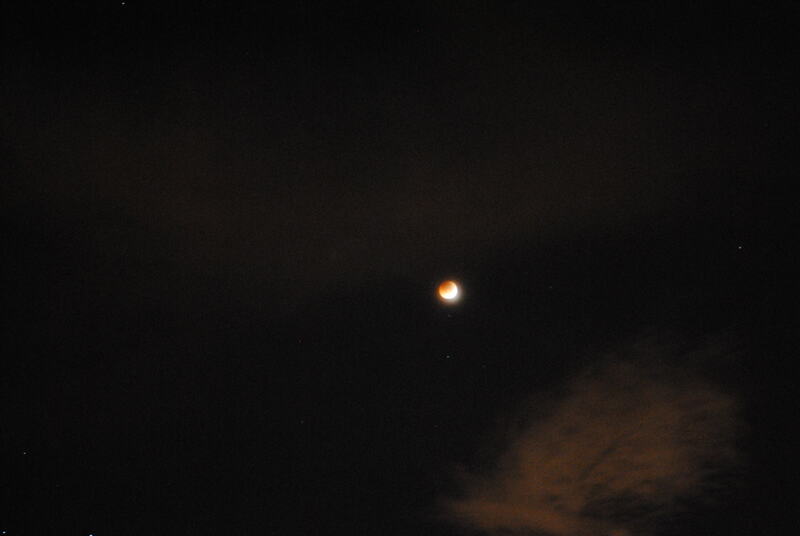 Here is a time-lapse video of the setting eclipsed Moon which I made using Windows Movie Maker. The transition of the images were quite slow because each frame can only be separated by a minimum of 1 second when using WMM. Can anyone suggest a better video editing software (preferably with a small size on disk) that can be used by amateurs? Only a small part of the Moon remained visible as it continuously sank near the horizon. A few minutes before sunrise, we noticed another nice atmospheric phenomenon — anticrepuscular rays. 5:14 AM — a small part of the Moon was visible above the city skyline. The pink lines above were anticrepuscular rays. 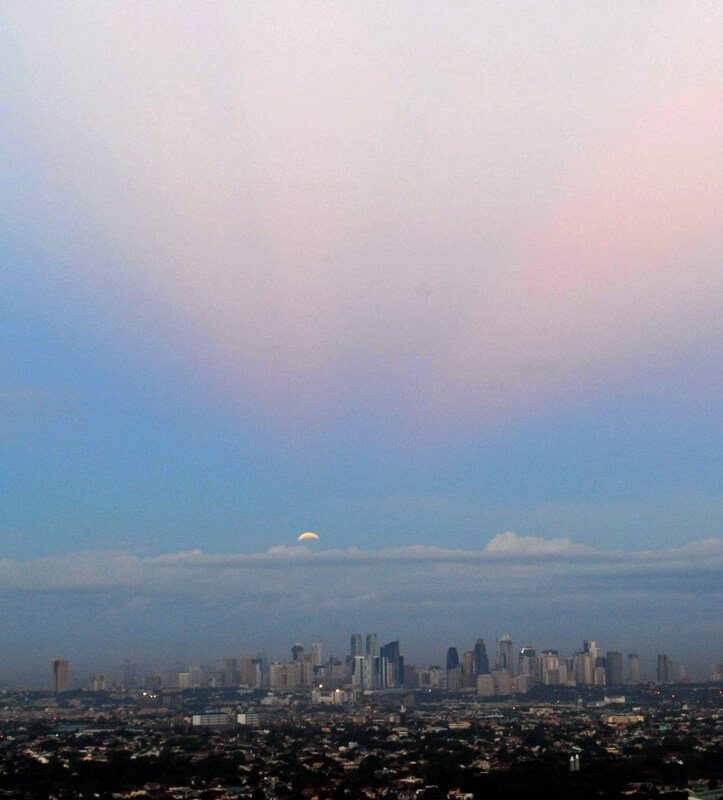 Anticrepuscular rays are similar to crepuscular rays, but seen opposite the sun in the sky during sunrise or sunset. We packed up and prepared to leave at around 6:00 in the morning. I was starting to feel tired during then but I resisted sleepiness as I still need to attend my class. One of us even said that we were already like zombies during that moment because of sleep-deprivation. Haha! Our efforts didn’t go fruitless, anyway. 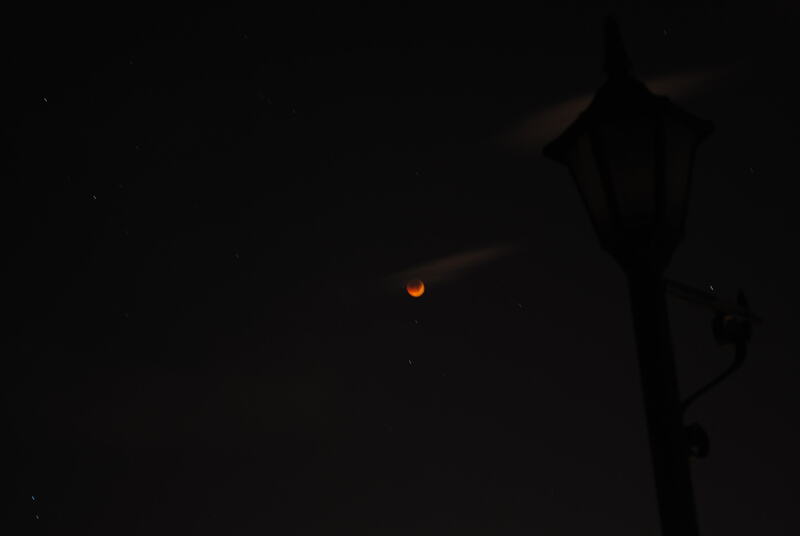 Seeing the Red Moon was truly a priceless experience. Besides, I was also happy that I was finally able to set foot in Seven Suites after a few years. Yes, I’ve been planning to visit the place ever since. but some circumstances seemed to hindered me most of the time. My fellow UP AstroSoc members who observed at the PAGASA Observatory were also successful in observing and documenting this event. God is really great, we were not clouded out. 🙂 Like us, they also got interviewed during the event. The news reports including the interviews came out later that day. The person from GMA who contacted me texted me that the video coverage was already being aired. I wasn’t able to catch it on the television but it was now available online. You can watch the video of the interview from here. This “live” doodle showed a live feed of the lunar eclipse from images from robotic telescope service Slooh. During the eclipse, visitors to Google.com can see a dial at the bottom of the image moving left to right, going through the various stages of the eclipse, before settling on the current feed. On the other hand, clicking on the doodle will take you to the top search results about the 16 June Total Lunar Eclipse. Some friends told me that the link to my blog about the visible eclipses in the Philippines in 2011 was on the 4th spot. 🙂 And indeed, I got a lot of site visitors during that day. Thanks to all who dropped by and left their wonderful comments. ‘Til the next Total Lunar Eclipse on December. 🙂 Ad astra! 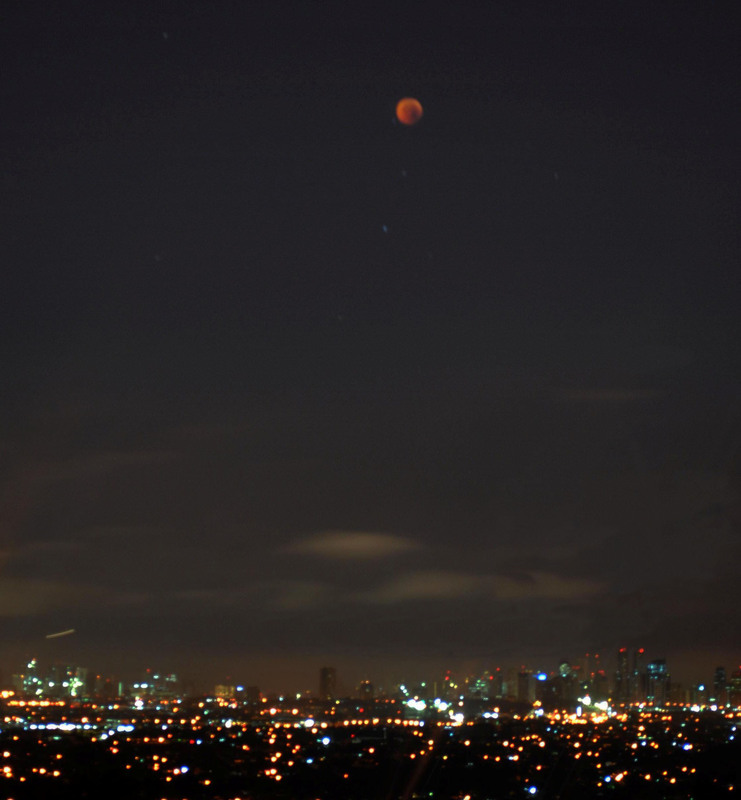 A marvelous apparition of a blood-colored or deep red Moon stunned a lot of Philippine sky viewers during the Total Lunar Eclipse last June 16, 2011. The totality time lasted for about 1 hour and 40 minutes. At the time of the totality – when the Moon passes through the Earth’s umbral shadow – the entire disk of the Moon turns vibrant red. The Earth’s atmosphere which acts like a filtered lens bends red sunlight into our planet’s shadow and scatters out blue light. It’s the same reason why sunrises and sunsets appear reddish. If Earth had no atmosphere, its shadow would be pitch black and the eclipsed moon would be invisible. According to some astronomers, this eclipse was the darkest lunar eclipse in almost 100 years because the centers of the sun, the earth and the moon were nearly be on one straight line. 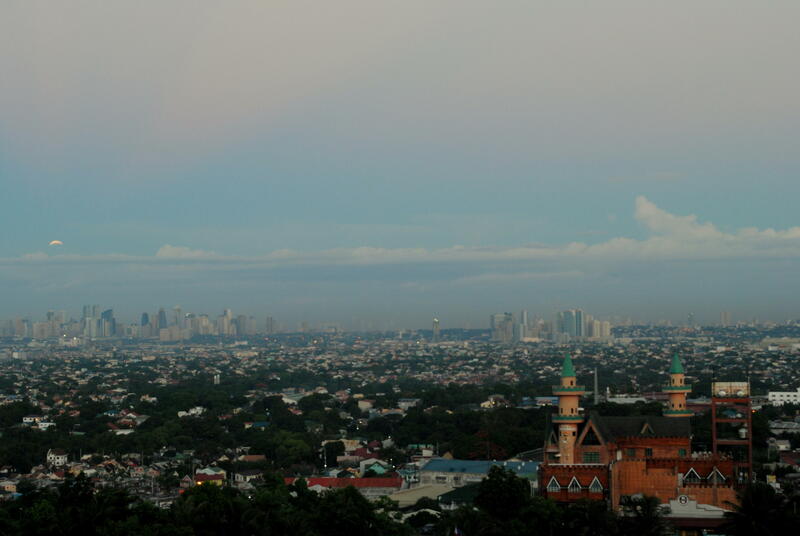 This photo was taken from the very nice Seven Suites Hotel Observatory in Antipolo. As you can observe, the image was a bit out-of-focused. I had a hard time focusing on the Moon as subject during that time because I didn’t have a good telephoto lens that could’ve made the Moon appear clearer and larger. Telephoto lenses are well-designed for photographing distant subjects like the Moon. However, those are very expensive. Wide angle lenses used in landscape photography such as this makes the moon look even smaller than how you had visualized it in the scene. The University of the Philippines Astronomical Society (UP AstroSoc) invites everyone in observing the spectacular total lunar eclipse on June 15 – 16! After the moon got super huge last March 2011, this coming June 16 2011, the moon will once again be spectacular to watch as it turns red because of the total lunar eclipse. 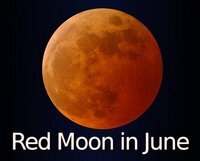 The first of the two eclipses of 2011 will occur on the said date and it will start at around 1:25AM and will end at around 7AM but the fun part where it turns red will be on its totality at around 4AM. What is more special about this eclipse is that this will be the darkest lunar eclipse in almost 100 years as the centers of the sun, the earth and the moon would nearly be on one straight line. This also means that the Moon will pass deeply through the Earth’s Umbral Shadow which will make the totality phase last about 100 minutes. This event is open to all. 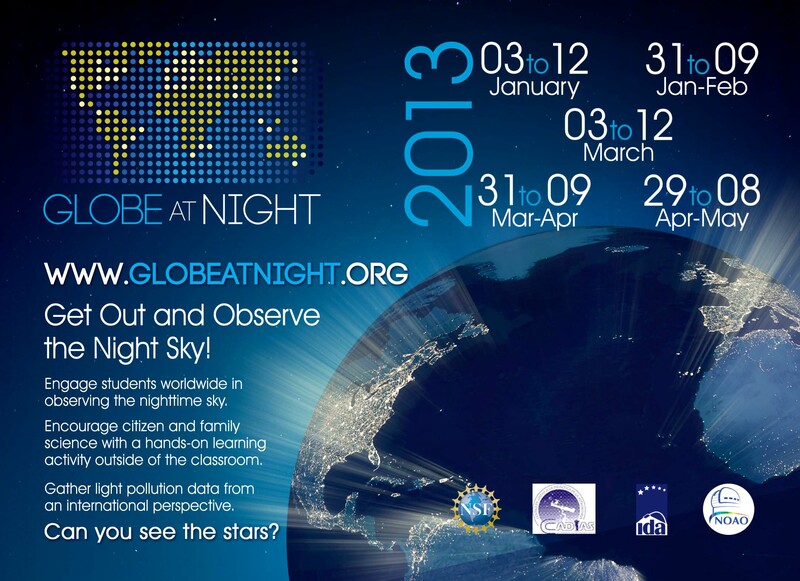 Come and invite your family and friends, and witness this wonderful sky show.